Don’t miss America’s Gaysian Sweetheart! Alec Mapa played the role of Adam Benet on the popular prime time show Half & Half, as well as, Suzuki St. Pierre on Ugly Betty and Vern on Desperate Housewives. He recurred as Renzo on Switched at Birth. In 2013, Alec debuted in his own one-man show, Alec Mapa: Baby Daddy which was made into a concert film and premiered on Showtime. Alec will also be the Grand Marshall for the Sonoma County Pride Parade – Saturday, June 2 in downtown Santa Rosa! Join us for our 31st annual Sonoma County Pride celebration event, the first in our new location. This year’s parade will begin at Fremont Park, travel down 4th street and will end Old Courthouse Square. This year’s theme is Together We Rise. Since the election many in our community feel threatened by the hateful rhetoric and policies of the current national political leadership. Also the recent tragic fires have brought trauma and dislocation to many. This year’s theme is about joining together to resist bigotry and discrimination and helping our community heal and rebuild. Parade participants are encouraged to design their unit to show that Together We Rise. Join us for our 31st annual Sonoma County Pride celebration event, the first in our new location. This year’s parade will begin at Freedom Park, travel down 4th street and end Old Courthouse Square. Take a trip down memory lane… and learn more about how the LGBTQI community has evolved in this county. Sonoma County has long been a friendly and welcoming home to LGBTQI people. In the 1970s, lesbian and gay culture flourished here. The Gay Liberation and Lesbian Feminist movements created grassroots organizations and leaders, businesses and social groups dedicated to coming out and establishing ourselves in public spaces. LGBTQI people moved to Sonoma County from other less welcoming areas to enjoy the freedom created here. This first year, The North Bay LGBTQI Timeline highlights the transformative years of 1970 to 1990. This collection of images and descriptive narratives will amplify your experience of PRIDE! Look for this informative and engaging exhibit at the Sonoma County PRIDE Festival, Saturday, June 2nd at Courthouse Square in Santa Rosa. 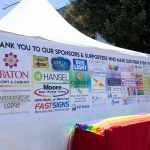 This year North Bay LGBTQI Families is working hand-in-hand with 2018 Sonoma County Pride Festival to bring our community of families the inaugural Kid Zone! Join us after we march in the Pride Parade for more LGBTQI family fun with complementary refreshments and activities from generous community sponsors and donors. The Kid Zone is open to ALL families. Adults accompanied by children only please! Sonoma County Pride is pleased to be working with Sonoma County Bicycle Coalition to offer Free Valet Parking at 2018 Sonoma County Pride Festival! What a great way to reduce your carbon footprint while celebrating pride with us! Free Valet Parking is brought to you by: The Astro Motel & The Spinster Sisters – Thank you so much for your support! After the 2018 Sonoma County Pride Festival 2018 Sonoma County Pride Parade come and celebrate into the night with Santa Rosa Gaydar – Sonoma County and your friends. We will be offering drink specials. We will be rockin’ into the night with a DJ and a Special Drag Performance by Patti Cake! $10 Suggested Donation at the door. Donations benefits Sonoma Count Pride. What are you doing on Pride Sunday?? Gather together at Third Street Cinema to Laugh, Cry and Find Yourself in this collection of Fabulous Short Films. Full Details About Don’t Blink!